As an independent 501c3 organization, we value and are most grateful for the ongoing financial support of the Sisters of Charity, Sisters of St. Joseph, our Board of Directors, and other generous friends of Sacred Threads. Click button to donate through PayPal. 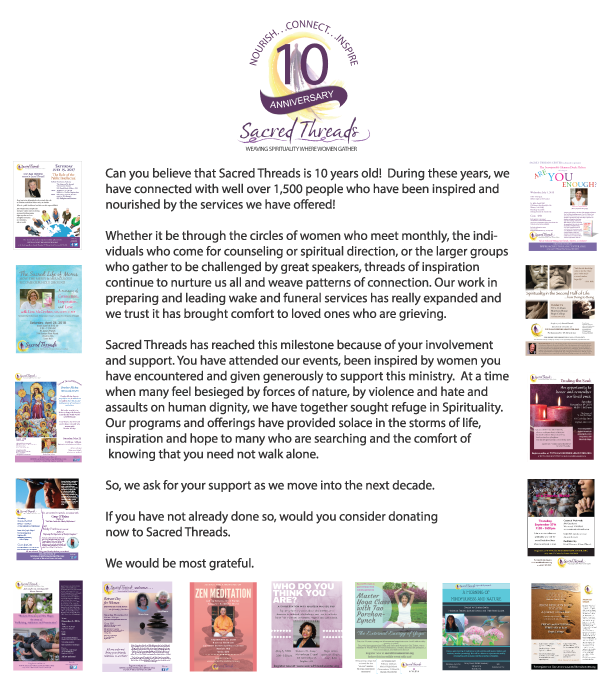 However you might choose to support the work of Sacred Threads, know that it will be appreciated and enables the strands of spirituality and community to strengthen. We are a registered 501(c)(3) non-profit organization, and your gift will be acknowledged for tax deduction benefits. Or you may opt to have your credit card charged monthly on the 1st of the month. Monthly payments will be charged automatically unless a change is requested directly to Sacred Threads. You may call in your credit card information or any changes to your gift to 617-894-0119.